It's one of the fastest-growing broadcast markets in America - and, until recently, one of the most under-radioed. It's home to Coca-Cola, Ted Turner and the 1996 Olympic Games. And, until this past March, your editor had never been there. "There," of course, is Atlanta, the media capital of the South. We pulled in late one Thursday night after a marathon drive from Chattanooga - by way of Brasstown and Asheville, N.C. and Spartanburg, S.C.
After a good night's sleep, we were ready to take on the town, with the able help of loyal Tower Site and NERW reader Roddy Freeman as our local guide. We headed south from our hotel in the Buckhead section to check out some of the towers we could see blinking in the distance - beginning with WTBS itself. Yes, there's still a Channel 17 in Atlanta, long after it was really necessary to have a local broadcast base for what most Americans now know simply as "Superstation TBS." 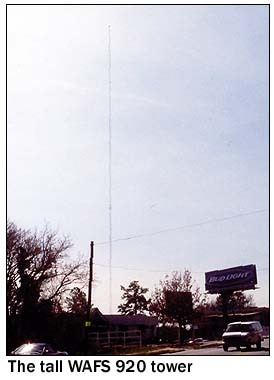 WTBS transmits its local signal from this tall self-supporter just a few short blocks from what passes for "downtown" Atlanta, and closer yet to the hotel whose rooftop was the original home of Atlanta radio giant WSB. Instead, we turn into a leafy suburban area, snap a few quick pictures of WSB's next-door neighbor, NBC affiliate WXIA (Channel 11), which has always been something of a poor stepcousin to market-dominant WSB-TV, and pull into the parking lot of the enormous white building that's home to WSB (750), WSB-FM (98.5), WBTS (95.5 Athens), WALR (104.1 La Grange) and WSB-TV (Channel 2). 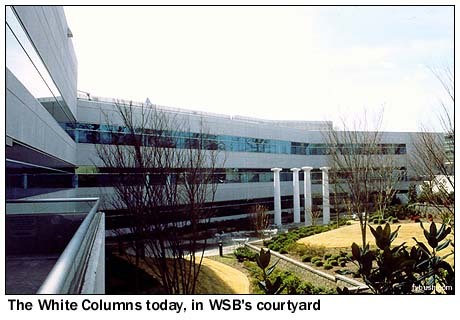 "Huge" is not an adjective that anyone would have used to describe the WSB facility if they'd visited as recently as five or six years ago. That's because WSB's home, on this same piece of land at 1601 W. Peachtree, was an antebellum-style mansion known locally as "White Columns" in honor of the, yes, white columns that decorated its facade. 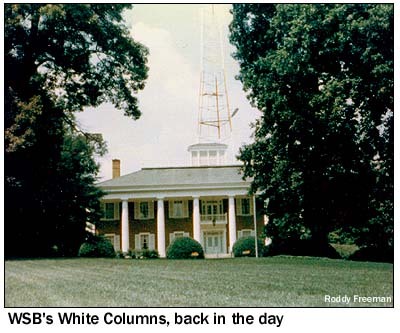 White Columns was barely big enough for all of WSB's various activities almost from the start, and with the addition of more FM stations and WSB-DT to the Cox Atlanta family (which also includes the Atlanta Journal Constitution), the need for a new building became urgent. WSB's long history is far from forgotten, though; in the hallway leading from the lobby to the WSB-TV studios, a series of display cases highlight the station's past, including the chimes that were said to be the model for the famous NBC "G-E-C" musical signature and the childrens' show puppet that inspired Toy Story's Woody. Look carefully at the picture above and you can see the enormous glassed-in lobby area; look even closer and you can make out the new "White Columns" that line the lobby, another subtle homage to WSB's past. 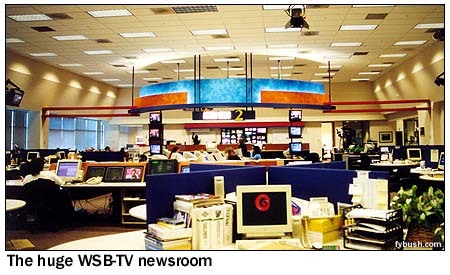 WSB-TV occupies most of the top two floors of the building; we get a look at the large production studios and news studio before visiting the newsroom. Channel 2's newscasts have long been among the most dominant, ratings-wise, of any big-market station in America, and Cox doesn't skimp on much of anything to keep it that way. With the coming of DTV, WSB-DT has even done some local HDTV production, still a rarity in the business! 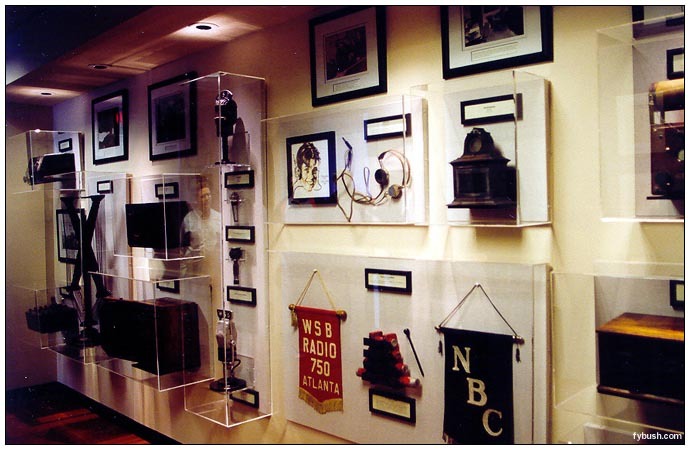 The radio stations are in a separate space downstairs (nominally the basement, but with windows opening to the courtyard and to the rear of the facility), with studios arranged around two sides of a big room that houses the WSB radio news staff and space for the other stations' jocks. WSB radio does its own traffic reporting from here as well, rather than farming it out to Metro or Shadow, as has become common in most other markets. And what about the original White Columns? They're still here, occupying a place of honor in the big courtyard that also serves as an outdoor lunchroom for WSB staffers. It's quite a facility - and the small size of the original columns should serve as some indication of just how huge the new WSB building is! From WSB, we head back into downtown, stopping by the Braves' new stadium at Turner Field (which served as Olympic Stadium in 1996) and the nearby WREK (91.1) tower at Georgia Tech before settling in for an iconic Atlanta lunch at the Varsity Drive-In, widely believed to have some of the best hot dogs in America - and who are we to argue? That tasty lunch was followed by some telephoto action, as we aimed the camera down the street at the Westin Hotel, whose rooftop is home to WZGC (92.9), new move-in WWWQ (100.5 College Park, which moved all the way from Anniston, Alabama, 70 miles to the west) and UPN affiliate WUPA (Channel 69). WUPA's digital signal won't come from here, though; there's just not room on the rooftop for another UHF antenna, so the Viacom-owned station is building a new tower, which we'll see in Part Two of our Atlanta visit. Next up, we're headed northeast, aimed eventually for the WSB(AM) transmitter - but with plenty to see along the way. 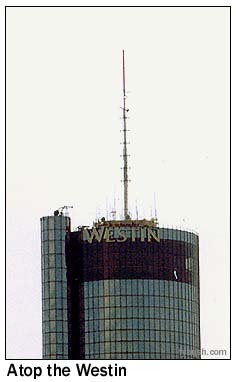 Look up from I-85 as it crosses Piedmont Avenue and you'll see Tribune's Atlanta entry, WATL (Channel 36), the WB affiliate for the market. 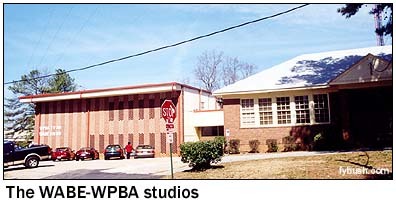 A few blocks away on Bismark Road sits the rambling studio-office complex of Atlanta Public Broadcasting, WABE (90.1) and WPBA (Channel 30). 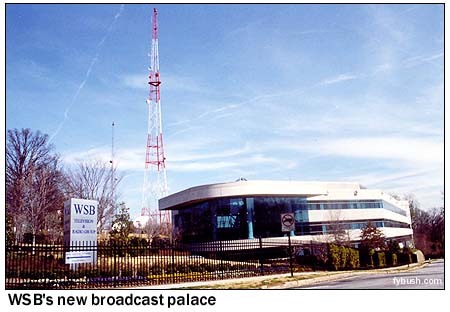 While WABE is Atlanta's flagship NPR outlet, WPBA has always been something of a smaller cousin to the GPTV statewide network, seen in Atlanta on WGTV, channel 8, from Athens. 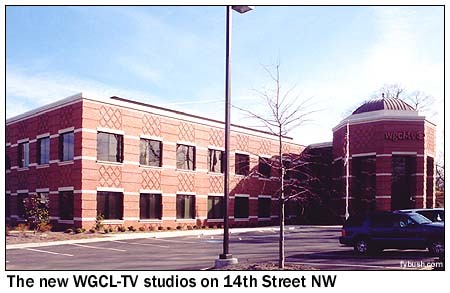 GPTV is near downtown on 14th Street NW, a few blocks from a brand-new building that's home to Atlanta's CBS affiliate, WGCL (Channel 46). 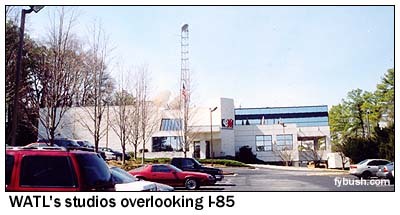 This is one of the markets where CBS found itself on the losing end of the Fox/New World affiliation swaps of the mid-90s, when longtime Atlanta affiliate WAGA-TV (Channel 5) became a Fox affiliate, leaving the Eye network to hook up with what was then Tribune-owned independent WGNX on Channel 46. 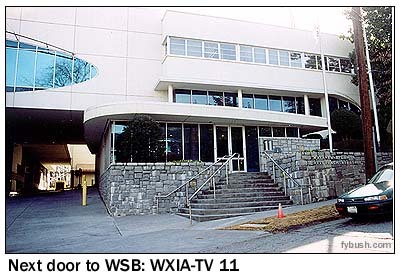 Repeated changes in identity (the station was known for a while as "Clear TV," then simply as "CBS Atlanta") and ownership (Tribune jumped at the chance to acquire WB affiliate WATL and sell channel 46 to Meredith) haven't helped matters any, and WGCL remains a low-rated afterthought in a market dominated by WSB-TV, and to a lesser degree WAGA and WXIA. The station moved into these digs on 14th Street just a year or so ago; we'll see where it used to be in next week's Tower Site installment. We'll close out this week's episode out along Cheshire Bridge Road, a few miles northeast of downtown Atlanta, home to a bunch of seedy strip clubs, restaurants - and several AM facilities! 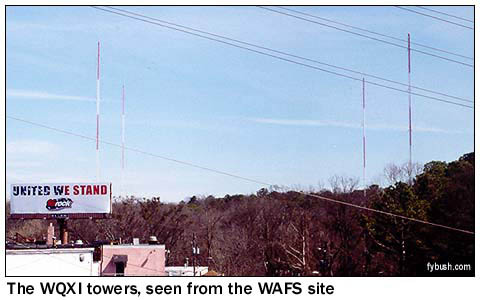 WAFS (920) transmits from the tallest of the towers on Cheshire Bridge Road, with a very old transmitter building set down a steep slope from the road. Believe it or not, this was once the second most important AM in town, under the calls WGST, until that station took the opportunity in the late eighties to buy a struggling new facility down the dial at 640. 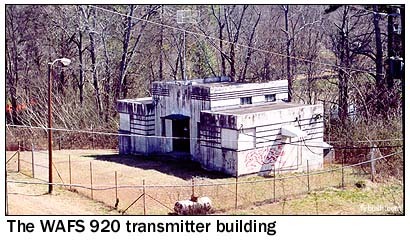 The move gave WGST 50 kilowatts by day, but just 1000 watts at night from a site to the west of town, far less favorable than this very central location, and some would argue that WGST could have done better in the long run staying at 920, where it had 5 kilowatts non-directional by day, 1000 non-directional by night. In any case, 920 is now religious WAFS, which puts it in harmony with some of its neighbors along Cheshire Bridge Road. 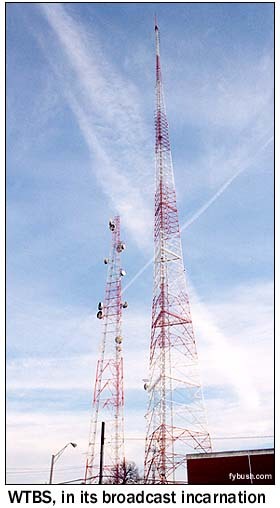 From WAFS, we can look just north to see the four towers of WQXI (790), once the big top-40 voice in town and now running sports and leased-time talk (and with daytime power now upped from the old 5 kilowatts to 28 kilowatts) - and just behind WQXI, the single tower shared by daytimer WGKA (1190), which used to be the classical station and now does religion, and religious WNIV (970). 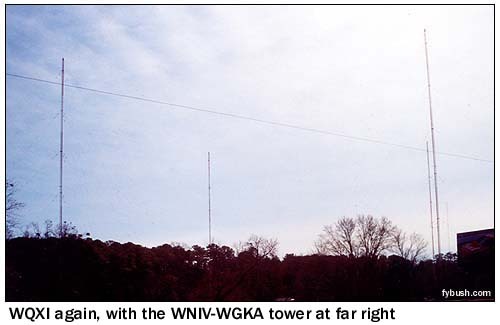 The WGKA-WNIV tower is very hard to see in these pictures - but look carefully just to the right of the rightmost WQXI tower in the photo below and you can just make it out in the distance! From here, we head out to some TV towers - and to the mighty WSB 750, too - but you'll have to come back next Wednesday for Part Two to see all that, not to mention a few more studios, the rest of the Atlanta AM dial - and a little thing called CNN Center.